This post will tackle the issue of how to exactly become a ‘full stack WordPress developer’. In general a full stack developer is someone with the knowledge and skills to be able to handle not only the front-end or back-end, but both, and everything in between. Starting from server and hosting, to in-depth understanding of required coding languages, to APIs, user interface and user experience, acquiring this skill-set is a tall task for even the most dedicated or obsessed learner. Note: They are in alphabetical order and not in order of importance. TinyMCE is the in browser text editor that WordPress.org uses in it’s admin area. Calypso does not use TinyMCE however, but the current .Org open source version still ships with TinyMCE included as part of the core. The rest of the libraries are all smaller libraries included to serve a single, smaller purpose and perhaps not worth as much attention as the others. Before we deal with some of the more complex workings of WordPress, there is the sometimes confusing template hierarchy. It’s important to have a complete mastery of the template hierarchy when developing themes for clients, as you can save them trouble and energy by creating a theme that automatically applies the correct templates to the correct pages. 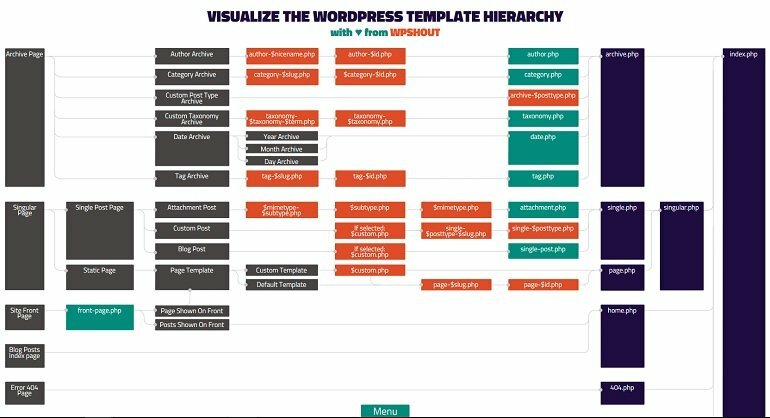 An easy way to get more familiar with the template hierarchy, is to take a closer look at the visual representation pictured above over at wphierarchy.com. You can also read some of the articles diving into the template hierarchy in greater depth. A common question many beginner WordPress developers have when they are first starting out, is whether the Theme’s functions.php file is loaded before or after plugin files. This is relevant when it comes to code priority, as the code dealing with the same things that is loaded the latest will be the code that controls the final outcome. The theme files are in fact loaded after plugins, but, the way you are asked to add most functions to your themes and plugins, hooking and executing them at the init hook, priority in most cases is not determined by file order. Instead, you can actually assign a priority to your function in the add_action() function. For more information you can check out a great stackexchange answer that deals with explaining exactly this. WordPress functions are the backbone of a lot of what you can do with WordPress. You often rely almost solely on them when developing themes. The funny thing about the sheer number of WordPress functions these days, is you might find yourself developing a custom function in a theme or plugin, just as you realize WordPress has already added that to core. So to avoid ending up in that situation, as well as just bolstering your WP development ability in general, it’s important to get to know all the most important WordPress functions. API is a term that refers to code that allows a program to communicate with another program. In addition to a host of internal APIs that help different parts of WordPress communicate and work together, WordPress recently included a REST API as part of core. The REST API allows WordPress to fluently communicate with websites and programs that are not WordPress or even written in PHP. For example, you can have a WordPress membership site, and then get date from and even submit new information to that WordPress site using an Android or IOS application. The theme customization and modification APIs are important for any developer to get familiar with because of their necessity in theme development. They work with the theme customizer to allow the end user to make changes to the design of their website without ever having to mess with the source code. And the REST API is obviously important for all the reasons we went over already. The API allows you to build complex applications using WordPress as a base. So anyone labelling themselves a full stack WordPress developer should be extremely familiar with how it works and realistic use cases. Just as becoming a full-stack developer in general requires in-depth knowledge of every stage of getting a website or application from the server to user, a full stack WordPress developer must have the same deep understanding of every nook and cranny of WordPress. This is on top of the understanding of the languages and libraries under the hood. A tough ask even for a seasoned developer, but you might get there. However, if you’re a beginner, the day you can attach that moniker to yourself is many years (if not decades) down the line. However, even if you are just starting out, hopefully this post can point you in the right direction for elements of WordPress core to get more familiar with. i have basic knowledge about php and working knowledge of html css and js. Basically i am fronted designer but i want develop wordpress theme and plugin also. So my question how long time i will become a wordpress developer and how?